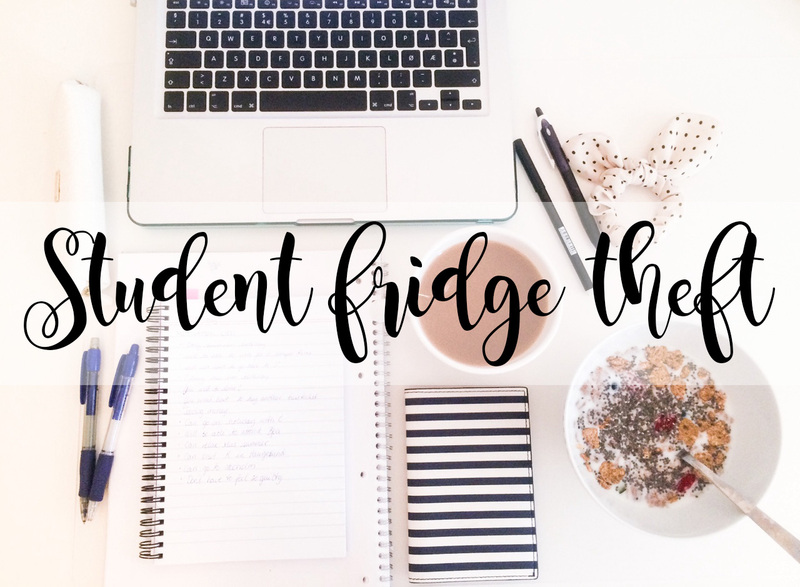 So if you are a regular reader of my blog then you would have seen my "A University Student Living At Home" post where I spoke about the amazing aspects about living at home while studying at University and the negative parts too. However, it never occurred to me how I also do not have the issues of having my fabulous bakes and other food items stolen out of the fridge by other students. (Well, only sometimes I do). Which made me think is this a normal thing? Does every university have someone who goes out to steal people's food? Or the person which cannot be bothered to go out and buy food so they steal their friends? Does this happen? A recent survey created by Data Label revealed how a third of people have their food stolen from communal fridges, whether this is in student accommodation or even in a work place. How many people is that? Someone work this out! I'd love to know. I think it's crazy how people can steal food out of a fridge which isn't theirs. I personally wouldn't nor could do it to someone! When I think about people having their food stolen from a fridge I automatically think of Ross from the TV show Friends who was always having his sandwich stolen from the fridge at his work place which lead him to write a nasty letter and the person still ate his sandwich! It makes me smile just thinking about it! I haven't wrote a nasty letter on my food to someone who has stolen my food, however I have wrote "DO NOT EAT" across the bag or container which it is in so no one eats my food and it has worked on every occasion! I absolutely loved reading The Independent's post on How to write a passive aggressive note in seven easy steps, it is absolutely brilliant! I may just have to write an aggressive letter one day, even for an anonymous cheeky joke to cheer someone's day up in the University's kitchen! I know it would definitely cheer me up seeing a random aggressive note pinned to the fridge! Although being a student who lives at home, I have had my food stolen from the fridge or even from a cupboard by my brother and my dad! Fairly often there has been something left for me to eat and if I haven't eaten it within a certain time limit, one of them have eaten it for me! You can probably imagine how annoyed I have been, especially when it's a cake or doughnut or something very very yummy! However, it's usually the mouth watering sausage rolls from Tesco which disappear first! Unfortunately. I know when I move in with my boyfriend I may have to start writing my own passive aggressive note to stop my boyfriend from stealing food from the fridge which isn't his! Have you had your food stolen at University from the communal fridge? Or even from your fridge at home? I'd love to hear your food theft stories! This was a collaborative post however all opinions were my own! In the second year of my undergrad degree I used to get food stolen from my fridge on nearly a daily basis which was so irritating! I'd come down in the evening ready to put my pizza in the oven to find that it had disappeared! 😡😡 I ended up buying my own mini fridge for my bedroom as it happened so much and the food was never replaced!